Connie, that means you are looking at the file in the Safari application, not Preview application. Somewhere along the line you must have chosen to open pdf files in Safari instead of Preview. You will need to ”ight click’ (control click) on the pdf file and select ‘Open With’ and select ‘Preview’. Then follow instructions as above. In my version of preview I have a button next to the search field in Preview that looks like a pencil – when i click on this it gives me the toolbar. I think this is a fantastic tool!! Hi! This is a great help. My only problem now is that the text that I enter is formatted to appear central whereas i would like it to be left aligned or even justified. Is there a way of doing this? 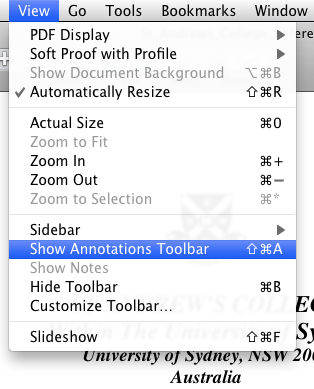 The pdf document came up in Preview, but there is no “show annotations” on the toolbar. What now? Hi ok, fantastic. Did all of the above on preview to add some text to a business card which was sent to me via pdf. I saved it. Happy days, it looks great when I reopen the pdf and is now there but…when i go to upload it to Vistaprint its not showing the edited image only original. What am I doing wrong guys? Interesting. You could try ‘printing’ the file to another pdf and see if that fixes it. I can edit and add. But when I want to print, the document comes as it where originally. How can I print it with the edited text I just did? That’s strange it should print with the edited version, Anyone else had this problem? Hi, Me too had a Same problem while printing the edited version of pdf, However the solution i figured it out that i exported the said pdf into word and then printed. Is it possible to use the editing features in this way, ie, strike through, highlight, etc? Or can we only use comment boxes? Also, can u tell me how to print? When I try to print a 4-pg document, it all goes onto one page. I can’t figure out how to print it like a regular 4-page doc. Super! I did not know the Preview app could do this! The menu option is called “Show Markup Toolbar” in my case. VERY helpful, thank you so much for posting this simple solution to filling in pdf’s. I opened my pdf in Preview. I opened the annotations toolbar, however nothing appears at the bottom of the window so I cannot add the rectangle. Now what? Thank you for sharing this, it was the only site that provided helpful information FREE and with visuals so the directions were easier to understand. Thank you so much – this worked great! 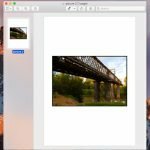 I find I am not able to edit or annotate PDF documents that I have gotten from scanning pages from paper or books in Preview (on my macbook pro). Can anyone tell me what is happening there, and recommend how to edit/annotate pages in PDF format that have come from my scanner? I would love to use Preview to do this, but if I have to use other (inexpensive) software to do it that also would be OK.
You need Optical Character Recognition software to do that. I did all the above and then saved the additions by exporting. now i have opened the document and the comments are unable to be viewed just yellow note squares. How can I revive the comments? Yes Acrobat Pro is very nice… but it’s not free. My white broad borders print out black…wth? As a matter of fact ANY color is transcribed as black to the printer. What am I doing wrong? I have a 2010 MacBook running OSX El Capitan. So I tried your instructions on editing a PDF (Acrobat) and when I clicked 2x on the document, Preview did not open. Am I doing something wrong. HELP. Or you could choose ‘Open’ from the ‘File’ menu in the Preview application. I appreciate your taking the time to put these instructions online. However, they don’t work for me, either– in fact so far all the instructions I’ve found on how online to comment on a .pdf tell me to click on a menu item that does not exist and does not show up when I look at the .pdf in front of me. I have tested all the possibilities in Mac’s Preview and in the .pdf’s toolbars. For example, you say that if I go to View in Preview, I will see “Show Annotations Toolbar.” It’s not there. I have a 2013 Macbook running Yosemite. You are correct, thank you for this. It looks like Apple have changed “annotations toolbar” to “markup toolbar” in Yosemite and El Capitan. Thanks, it was a little tedious, but good. I forgot to say what system, El Capitan. I have been filling in a lot of forms in PDF using the preview app. I find it very useful and easy to use. From time to time I have needed to strike through some of the text and now and again I have needed to change my mind on some of the text being struck through. Does anyone know how to undo the strike through? If it cant be done its good to know but if it can be done then that would be better. Thanks for your help in advance. Select the text, right mouse click and deselect strikethrough. I enter text onto a PDF form for my work using Preview. I save the PDF onto my desktop and it looks fine, the text is seen on the form. I then send the fax to a client using an online fax service and am seeing that the form is appearing blank upon receipt by the client. wow – if that’s a know problem since 2010 it’s a wonder Apple havn’t addressed it. Try ‘print’ the ‘save to pdf’? Try opening in Adobe Acrobat Reader and see what you get. Try editing in the free version of adobe acrobat reader? I did use when printing “save to PDF”. Then I used Adobe Reader to open that file and THEN saved it as an Adobe PDF. This seems to have worked! This seems to work but does it do anything that Preview can’t do? The ‘Preview’ method worked fine and did what I wanted to do. However I wasn’t able to alter the height of the text frames so I ended up covering parts of a couple of lines. Any suggestions for next time? No. The editing is very limited, you can’t actually change the text in the file you can only make annotations. To change the actual text in the file you will need a much more powerful program for example Adobe Illustrator. The title of the instructions at the top of this web page read: “How to edit a pdf document in OS X.” Since we are trying to edit a PDF, most people will open the file with Adobe Acrobat Reader, but none of the commands you describe exist in the View menu of Acrobat Reader. If you read between the lines and open the file with Apple’s Preview application, you will find “Show Markup Toolbar” in the View menu, but the tools made available do not allow one to edit the documents as you describe. I am using an iMac running macOS Sierra and Adobe Acrobat Reader version 2017. Yes that is correct, I am talking about using the ‘Preview’ application, not Adobe Acrobat Reader. Adobe Acrobat reader will not allow you to do any of these changes. But the built in Macintosh application called ‘Preview’ will.